One of the biggest meetings on the calendar is back and I will be doing a write up on each day, giving a few tips and a bit of insight into the big races. The post will be updated on a daily basis to show the next days racing. The rain has come down and the going at Cheltenham is currently heavy, heavy to soft in places. This could provide some shock results as the mud usually springs some surprises. However, their are two big favourites running today that are hard to look past in any weather. Buveur D’air runs in the Champion Hurdle at 3:30pm and is looking to win the race for the second year running. He has looked faultless in his 3 wins this season and I find it hard to look past anything but a returning champion. Faugheen has the potential to challenge but since returning from a lengthy spell on the sidelines hasn’t looked like the same horse. The other big favourite of the day is Apple’s Jade in the Mares Hurdle at 4:10pm. She is also out to defend her crown from 12 months ago and I have no reason to doubt her chances. The tough mare looks too good for the field and the soft/heavy ground shouldn’t be an issue. As expected, with big favourites come small odds and the same can be said about the Arkle Challenge Trophy at 2:10pm with only 5 runners and Footpad touted as a heavy favourite. He has the form to back up the odds but Saint Calvados also boasts some impressive form this season and is unbeaten over fences. The softer ground will only improve his chances which is why I’ve chosen to take on the favourite. The other races are a lot more open and offer some good each way value. The National Hunt Challenge Cup at 4:50 is a good example of this. Gordon Elliot has won this race 3 times in the last 6 years and he runs the two favourites in Jury Duty and Mossback. 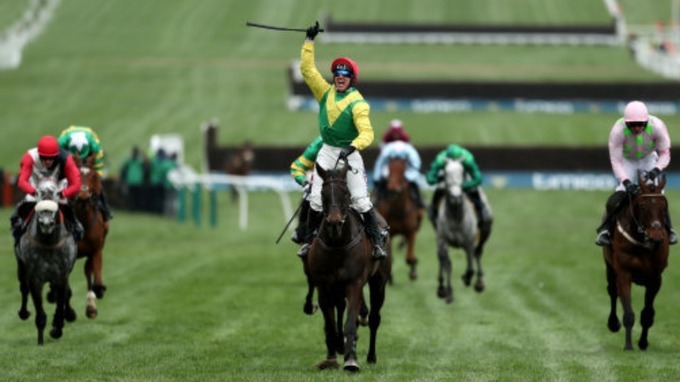 With the recent weather I am inclined to look elsewhere with Ms Parfois and Sizing Tennessee offering good value. I lean towards the former after a very consistent season and the step up to 4 miles should bring further improvement. Finally, Gold Present in the Handicap Chase at 2:50 comes in at top weight after two wins from two this season but he looks up to the task. This is part of his preparation for the Grand National but there is no reason why he can’t put in a good showing here. The weather didn’t seem to affect the favourites on the first day as 3 out of 7 races were won by the head of the betting. Ladies day is up next at Cheltenham and the going has been downgraded to soft, heavy in places. With no rain forecast until Thursday the track could improve further overnight. The big race of the day has to be the Queen Mother Champion Chase at 3:30pm with Altior, Douvan and Min going head to head. Altior had an injury scare on Monday but has been cleared as trainer Nicky Henderson stated he is perfectly sound and all systems are go. Douvan could still be moved to the Ryanair chase on Thursday and even if he did run here I can’t see anything beating Altior. He is 7 out of 7 over fences and it’s likely to be 8 out of 8 by the end of tomorrow. The other big favourite runs in the Novices Hurdle at 13:30pm. Samcro is odds on to win against the 14 runners but he is yet to sample the Cheltenham Festival atmosphere. Their is obviously a lot of potential there but how he copes with the occasion will be a big factor. I don’t think it’s worth the risk at the current odds and Next Destination offers a good alternative. The six year old has festival experience and won a grade 1 contest last time out. Monalee and Presenting Percy are the pick of the form in the Novices Chase. Presenting Percy won here last year but had a difficult race just 25 days ago so I will go for Monalee who looks like a high class performer and won a grade 1 race last month. If your after a fairytale story then Cause of Causes is aiming to win at the Cheltenham Festival in four different years. He won this race last year and has been reunited with the same jockey. There are sometimes horses that come to life at certain points of the year and Cause of Causes just loves Cheltenham. There are a lot of runners among the other races and my final pick is for Act of Valour in the Juvenile Handicap Hurdle at 4:50pm. He is trained by Paul Nicholls who has trained the 1-2 in this race in two of the last season’s.